Aussie Alexander Downer from Spygate fame not only signed a deal to provide $25 million to the Clinton Foundation but he was also involved in the sale of uranium to the same Russian state owned company that later purchased Uranium One. A co-operation agreement in the field of nuclear energy has been signed by Sergey Kiriyenko, the head of Russia’s Rosatom, and Australian Foreign Minister Alexander Downer that will see Australia supply uranium to Russia for processing and for use at its power plants. Kiriyenko added that the agreement will give Russia as much uranium as it wants, and will strongly enhance its uranium enrichment potential. The agreement may bring low-enriched uranium supply contracts with Japan worth $2 billion within 2008–2015, some $400 million with Europe, and $300 – $400 million with the United States, said Aleksey Grigoryev, acting director general of Russian uranium firm Techsnabexport (Tenex). The Clinton Foundation received $146 million shortly after the sale of Uranium One was approved by former President Obama and his failed Secretary of State Hillary Clinton. This resulted in 20% of US uranium landing in Russian hands. Soon after the Uranium One story was released Obama’s FBI in late 2015 and early 2016 ironically began an effort to align the Trump campaign with Russia. The far-left and their media then jumped on this narrative as the election transpired. What kicked off the Trump-Russia farce was supposedly a drunken discussion between a young Trump volunteer (George Papadopoulos) and Australian Ambassador Alexander Downer. The young American repeated to Downer what he heard from an FBI spy that Russia held a copy of Hillary’s emails. When he told this to Downer, it was somehow relayed to the US. Supposedly this is what started the official FBI Trump-Russia investigation. Now we find out that the Aussie involved in the scandal is also involved with the Clinton Foundation and uranium sales to Russia. Also, we now also know that the individuals that created or are part of the Mueller ‘witch hunt’, Rosenstein, Mueller and Wiessmann, were all part of the Uranium One scandal as well. 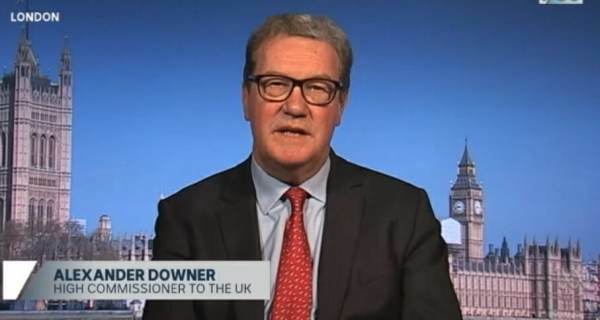 Australia would be wise to look into the various nefarious activities of Ambassador Downer. A serious review would no doubt prove beneficial to the ensuring the rule of law ‘down under’.